766 Hedges Lane in Wayne Tredyffrin Township, PA 19087. This a wonderful neighborhood, quiet cul-de-sac location just minutes to the R5 Strafford Train with easy access to Philadelphia, all major corporate centers such as Great Valley, King of Prussia and Chesterbrook. 766 Hedges Lane is a very spacious home featuring 5 bedrooms, 3.5 baths and a first floor Master Bedroom Suite. There are 3 bedrooms plus 2.5 baths on the first floor providing the potential for either an in-law or au pair suite. A formal dining room and formal living room with fireplace and picture window views to a large slate stone patio plus a paneled family room comprises the overall generous square footage. Two spacious bedrooms are located on the second floor together with a full bath. There’s a basement for storage and a 2 car garage all situated on a pretty .82 acre lot in sought after Tredyffrin School district. New BEST BUY price of $619,000 provides a great opportunity for you to add your personal touch! No delays! Move right in! Contact or call Judy Peterson, Realtor 610-889-5509 for additional information, Prudential Fox Roach Devon Home Marketing Center, Devon Pa 19333. 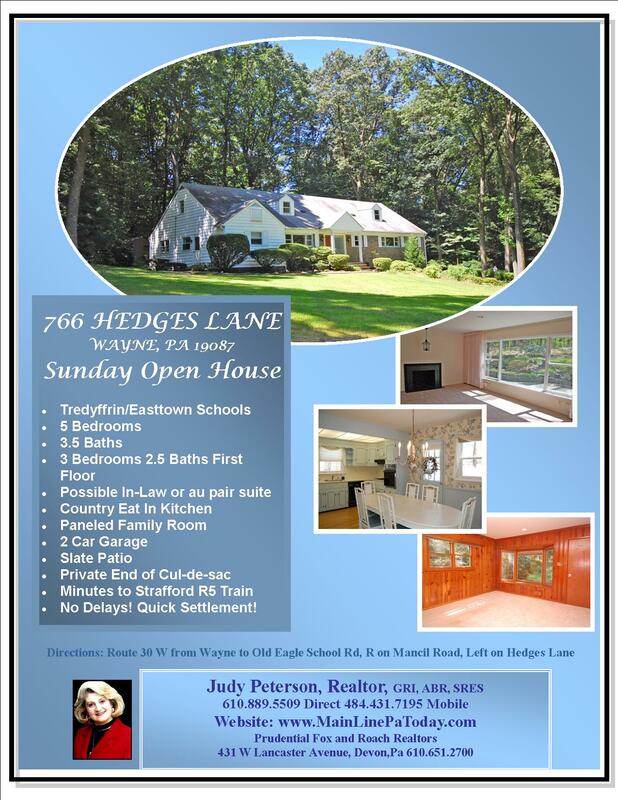 This entry was posted on Friday, August 14th, 2009 at 6:09 am	and is filed under Chester County, Home Sellers, Open House. You can follow any responses to this entry through the RSS 2.0 feed. You can leave a response, or trackback from your own site.